MK comments (20 Jan 2004): In making some of my comments on this page, I used information I got from Paul M. Roach (#85). I thank you very much, Paul. MK. 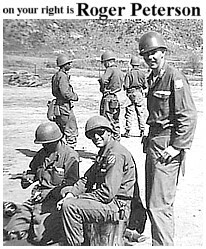 At the time the 2nd Bn of the 15th Inf Rgt was at the Reserve Area shown in these photos, the 1st Bn was guarding prisoners at the POW Camp near Pusan. The POW (and how!) Place is the photo page that tells that tale, or at least my part in it, and has a photo of the spot where I paced back and forth for many a day. 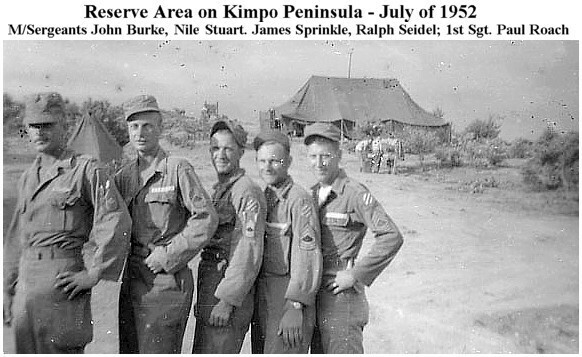 By late July of 1952, the 2nd Bn was back on the MLR and was making good use of Outpost Kelly when it was overrun by the Chinese. The 1st Bn arrived early on 31 July 1952 to join in the festivities. To see a photo of Kelly and read the start of its story, visit the Outpost Kelly photo page. 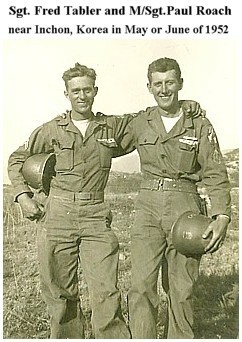 Paul told me that this photo was taken just before 1st Sgt. Penfold was rotated and left for home - just in time to miss the Kelly action in late July. The right-hand photo to the left, like the two above it, also was taken near Kinsel Village in May or June of 1952. 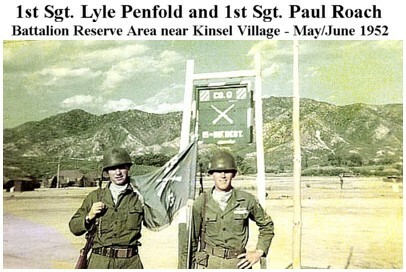 Fred Tabler and Paul Roach (in the left-hand photo) went to the same high school at the same time, took their basic training together, and did most of their time in Korea together in the 2nd Battalion of the 15th Infantry Regiment. 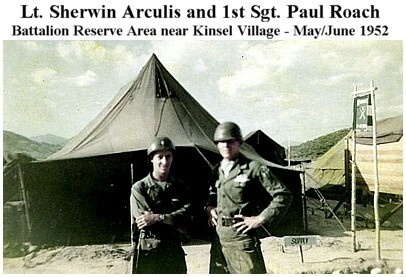 Paul was a 57mm RR gunner, then a Squad Leader, and then a 1st Sgt in G Company. Fred was a 75mm RR gunner and then a Squad Leader in H Company. Later, each of them was best man at the other's wedding and they are good friends to this day. Three of the other men pictured with Paul on this page are also in the Imjin Buddy Bunker. Sherwin ("Arc") Arculis is #6, Roger Peterson is #31, and John Burke is #42. I hope some of the others are able and will see fit to jump in the Bunker with us.